It's easy to forget that just two years ago many feared Janet Yellen and the Federal Reserve were trapped at zero. Yellen faced a puzzling challenge: How to raise interest rates without freaking out markets and disrupting the recovery? Under Yellen's leadership, the Fed has gradually moved interest rates higher and began to unwind its historic rescue program -- while other central banks remain in emergency mode. The Fed has executed this delicate strategy without derailing the recovery or markets. In fact, the economy looks very healthy right now, and stocks are booming. So even as Yellen is replaced as the leader of the Fed, there's a clear silver lining for her: She's exiting on a high note. "She did phenomenally well during a hard period of time. You can't say she couldn't be reappointed because of some error," said Sarah Bloom Raskin, who served as a Fed governor with Yellen until 2014, when she became the No. 2 official in the Treasury Department. 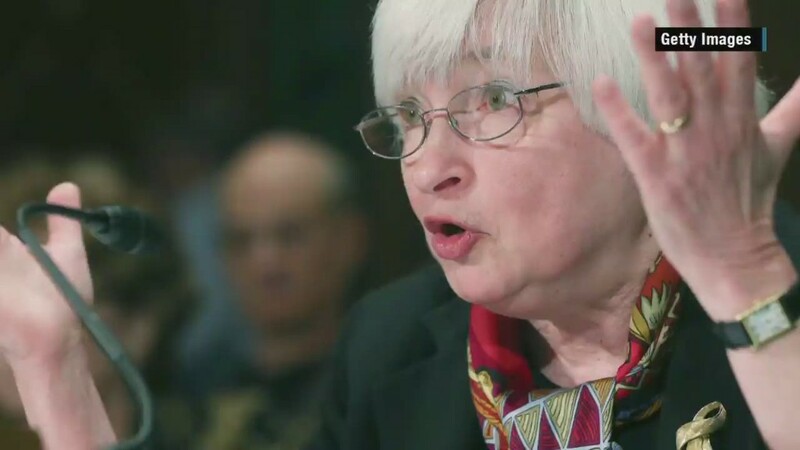 Raskin credited Yellen with "almost flawlessly" executing the Fed's plan to lift rates. "It's almost like no big deal right now, but it could have been. The space for error here is huge," said Raskin. Yellen "should be grateful" to step down now because "she'll go out on top," Greg Valliere, chief global strategist at Horizon Investments, wrote in a note to clients. Of course, Yellen didn't face the once-in-a-generation financial crisis that her predecessor Ben Bernanke did as Fed chair. When she was elevated in 2014 from the No. 2 Fed position to the top job, Yellen inherited an economy recovering from the Great Recession and a vastly healthier banking system. Yellen's challenge was threading the needle between weaning the economy off near-zero rates before bubbles and inflation reared their ugly heads. But not to exit so quickly that it halted the fragile recovery. Some accused Yellen of being too slow to act. But now many believe Yellen's patient approach paid off by allowing the job market to heal. The unemployment rate fell in September to a 16-year low of 4.2%, a lower level than some thought possible just a few years ago. And the economy is enjoying its best six-month stretch in three years. "The economy is in very good shape. The Fed has been spot on. It made exactly the right call," said Rick Rieder, who helps manage $1.2 trillion in fixed income assets at BlackRock. Of course, the economy isn't perfect. Even though Raskin believes Yellen did a "marvelous job," the former Fed official is concerned that the recovery hasn't lifted all parts of the country. "We're so much better than we were, but in my view we're not in a perfect place," she said. Related: Is now really the time for massive tax cuts? Critics argue Yellen's continuation of extremely low interest rates inflated prices for stocks, bonds, real estate and other asset classes. "Her legacy is bubbles everywhere," said Peter Boockvar, chief market analyst at The Lindsey Group. Boockvar, an outspoken bear on the market, said it's too early to understand the consequences of Yellen's tenure until the Fed gets back to normal rates and dramatically shrinks its balance sheet. "If we get there and we're not in a recession or a major bear market, maybe I'll change my mind," he said. As Yellen's replacement, Jerome Powell will be charged with guiding the Fed through the next phase of "normalizing" policy. That task could be complicated by the GOP plan to inject huge stimulus into an already-healthy economy. Doing so may force the Fed to more aggressively raise rates to prevent the economy from overheating. "Lucky Janet Yellen," Valliere said, "getting out just in time."